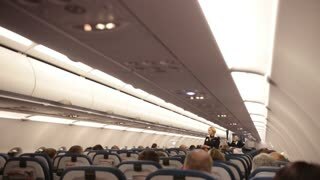 A low angle view of the Aisle of an airplane. Aircraft building. The board of the passenger plane. Commercial airline passengers watch as female flight attendant demonstrates seat belt during safety briefing. Medium shot from front of plane with camera dolly. SLOMO: A playful flight attendant walks on the wing of an aircraft. A playful flight attendant sits on the wing of an aircraft. A playful flight attendant walks on the wing of an aircraft. 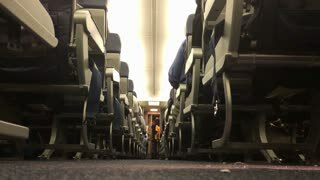 SLOMO: A playful flight attendant walks down the stairs of an aircraft. The Passanger Hand Turn On the Light in the Airplane. Flight Attendant Call. 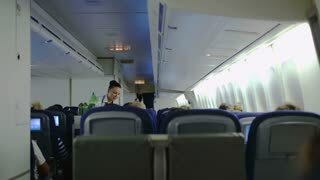 Airplane Stewardess/Flight Attendant Closes Baggage Compartments. Plane is Ready to Take off. Shot on RED EPIC-W 8K Helium Cinema Camera.